What's Hot! : An Apple a Day. . . It seems very true that we can pick up any fruit and then enumerate its several health benefits. Yet it’s interesting to explore what sets the apple apart. Apples are low in Vitamin C compared to other fruits. However, they are very rich in other antioxidant compounds. Apples do not have cholesterol, and combined with fibers and low energy density, they’re a good potion for heart disease, weight loss, stroke, etc. 1. 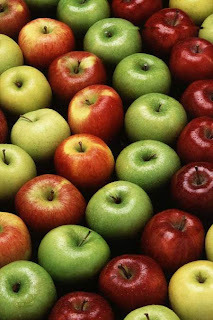 Mayo Clinic (USA) study: Quercetin, a flavonoid abundant in apples, helped prevent the growth of prostate cancer cells. 2. Cornell University (USA) study: Phytochemicals in the skin of an apple inhibited the reproduction of colon cancer cells by 43%. 3. National Cancer Institute (USA) study: Flavonoid rich foods reduce the risk of lung cancer by 50%. In a recent study comparing mice that drank apple juice to those that didn’t, the juice was found to increase mental equity and decrease oxidative stress. This study was conducted in the University of Massachusetts at Lowell, and was published in a recent issue of Journal of Alzheimer’s Disease. The finding suggests that apple juice in conjunction with a balanced diet can protect from age related memory loss. • Apples originated in Kazakhstan and were carried east by traders on Silk Road. • Apple seeds are like people, you’ll never get the same type of apple from a planted seed. • One apple has 5grams of fiber, supplying 20% of the recommended daily dose. • If you took all the Washington apples picked in a year and placed them side by side, they would circle the earth 12 times. Thanks for the "Apple A Day" insights. Such a simple snack or food that often gets left in the lunch bag. Wish there was a link here to post this article on facebook!